Daniel Robert Hamilton was the youngest son of Maurice and Elsie Hamiton. Delbert is a son of Duron Hamilton who was a son of Supplina and Sarah Jane 'Jane' Hamilton. Delbert lists his date of birth as October 2, 1893 in Waitsburg, WA. He is a married self-employed farmer in St. John. The card is signed and dated June 5th, 1917. Donald Hamilton was the youngest son of Judd and Annettie (Templeton) Hamilton and a grandson of Supplina Hamilton. 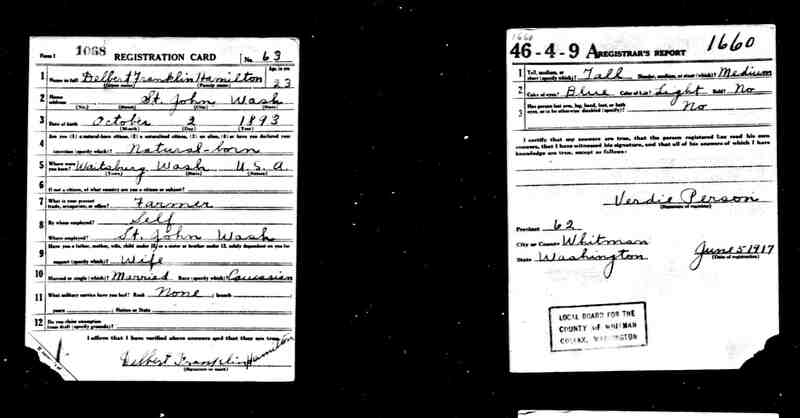 Donald Ramsay's WWI Draft Registration Card, Tonasket, Okanogan County, WA October 1918. Donald was an older brother of Lillian Mae Ramsay who was the mother of Elsie (Galloway) Hamilton. Donald lists his nearest relative as his mother, Mary A. Ramsay. Donald's late father was James Ramsay. Donald had two older brothers, George and John. It's very interesting that Donald lists his present employer as John Ramsay of Lake Saskatoon, Alberta and that is also the address he gives for his mother, Mary A. Ramsay! Lake Saskatoon is now a ghost town way up in the Grande Prairie county of Northern Alberta. The interesting thing is that this is the area that their younger sister, Lillian moved to with her second husband, William Fee, after their marriage in December of 1907. It seems reasonable to assume that the Fee's introduced the Ramsay brothers to the Grande Prairie, AB area. I'm assuming that Donald was farming his brother John's land near Wauconda, WA for him in his absence. Donald gives the legal description of the land he is farming as the 'location' of his employer on his registration card. Dora was the daughter of Supplina Hamilton and Sarah Jane Sumpter. She was married in her parent's home. This document is written by James Dunn Laird. James is a researcher for the Dunn families in Northern Ireland. 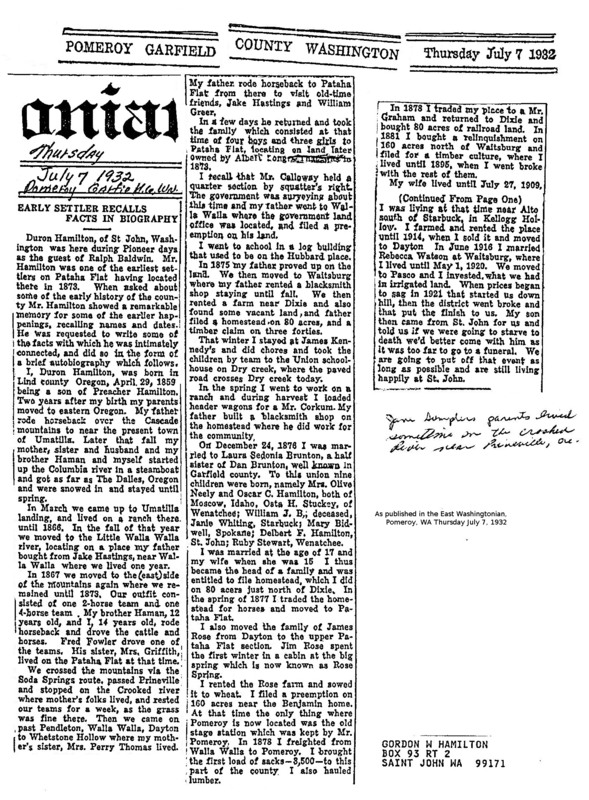 In working to establish a connection between Dunn families he had a genetic test done on a patriarch of one of those families only to find out that that man (in his eighties) is not genetically related to the Dunn's paternally but is descended from a Hamilton ancestor. This man, Herbert Dunn is an exact genetic match (37/37 markers) with our Hamilton family Y-DNA line (as profiled by Glen Maurice Hamilton's DNA). Duron Hamilton was the eldest child of Supplina and Sarah Jane (Sumpter) Hamilton. 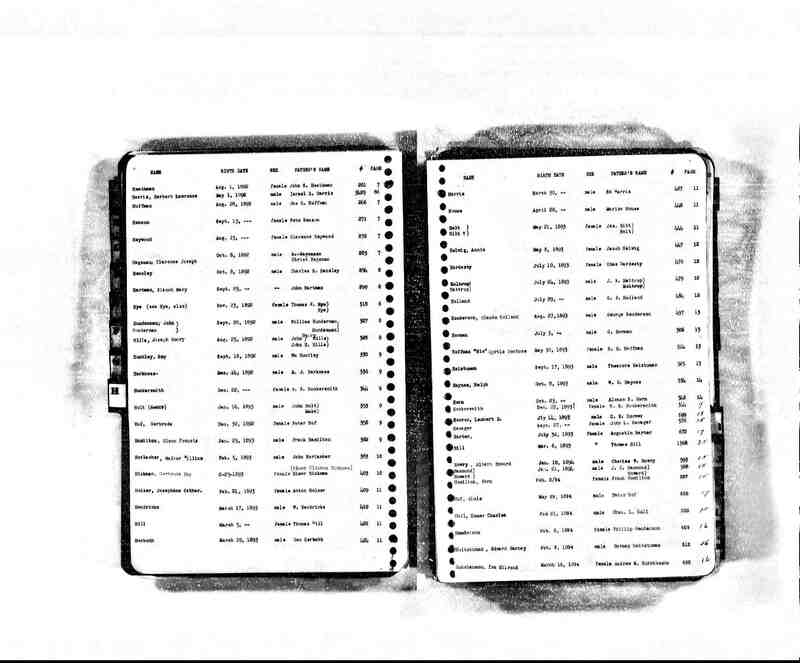 This is a PDF of the a hand written transcription of a profile of Duron Hamilton from the work, An Illustrated History of Southeastern Washington, published in 1906. Duron was the oldest child of Supplina P. Hamilton and Sarah Jane Sumpter. One of many interesting things in the document is a mention of Supplina Hamilton having been a 1st. Deputy of Joe Meek in Oregon City, Oregon in 1856. Joe Meek was a famous Oregon pioneer and was the 1st US Marshal in Oregon Territory. He served with Supplina Hamilton as a member of the 1st Regiment of the Oregon Mounted Volunteers in the Yakima Indian War of 1855 & 1856 and attained the rank of Major. Duron was the first born child of Supplina and Sarah Jane (Sumpter) Hamilton. Duron's first wife Laura S. Brunton apparently had passed away. Duron's second wife had also apparently died. This was the third marriage for both Duron and Rebecca and they were both listed as 'widowed.' Rebecca was born in Texas. This PDF file has a few selected pages of the volume, "Education in the Rough, with Memoirs of Early Teachers and Schools." It was published as a bi-centennial project by the Whitman County Retired Teachers Association in 1976. This is from a copy in the Seattle Central Library. The selected pages cover information on early schools in Whitman County, WA attended by the Supplina & Jane Hamilton children, grandchildren and extended family. Districts covered are: #111, Hamilton School - Endicott (Union Flat Creek); #162 Little Valley School - two miles south of St. John, WA; #168 Turner School - West of St. John, WA. 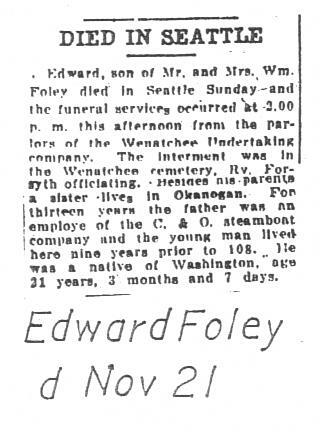 Edward Foley was a son of Martha Ann "Annie" Ramsay and William H Foley. Effie Hamilton, the daughter of Supplina and Jane (Sumpter) widow of Walter W. Gilbert, is now the wife of James W. Darland as of the 1930 Census. Effie had been a widow for a few years. As of 1930 she is 54 and her husband, James is 72. They have no one else in their household in Lenore. Effie is shown here as a widow of Walter W. Gilbert in 1920. The children still with her at home appear to be: Eldorado, 23; Leslie 17 and Mabel, 13. Effie was the daughter of Supplina and Sarah Jane (Sumpter) Hamilton. Elizabeth (Hamilton) McCan was the sister of Supplina Hamilton. She was known here as 'Aunt Lisy.' It appears that the caption at the top of the print on the back states her name and relationship as 'Aunt Elizabeth Cross sister to S. Hamilton.' This is a bit perplexing as we don't know of Elizabeth having been married to a Cross. Her sister Roxa married Able Cross in 1837. Elizabeth is thought to have married a McCan. Elling Lee is thought to have been the grandfather of Burton Odell Lee. Burton O. Lee married Arlene Hamilton the daughter of Maurice and Elsie (Galloway) Lee. Ellings' parents were Havlor and Ingelborg. Ingelborg's maiden name is thought by some to have been Lie. Elsie Galloway (soon to be married to Maurice L. Hamilton the son of Judd Hamilton and grandson of Supplina Hamilton) is listed with her father and step-mother in the 1920 Census in Spokane, WA. Elsie's father lists his profession as 'Miner.' They lived on 2nd Ave (thought to be East) in Spokane. Elsie's future husband, Maurice, was helping his mother Annettie at home in Nespelem, WA at this time. It is thought that Charlie Galloway had recently moved this family to Spokane from Nespelem. When Maurice and Elsie married they went to the Courthouse in Omak, WA Okanagon County. Elsie's father and step mother, Charles and Grace Galloway were living in Republic in 1910. Charles was working in his mining claims. Elsie's mother, Lilly (Ramsay) Fee had moved with her Canadian husband way north to Grande Prairie, Alberta. Seven year old Elsie is in Wauconda, WA in the care of her grandparents, Amasa and Elizabeth J. Galloway. Elsie also had three Ramsay uncles farming the Ramsay homestead near Wauconda in 1910. They were George, John and Donald Ramsay all in their 30's. Elsie's grandmother, Mary A. (Spaulding) Ramsay was living in Tonasket, WA (relatively nearby) in the 1910 Census. 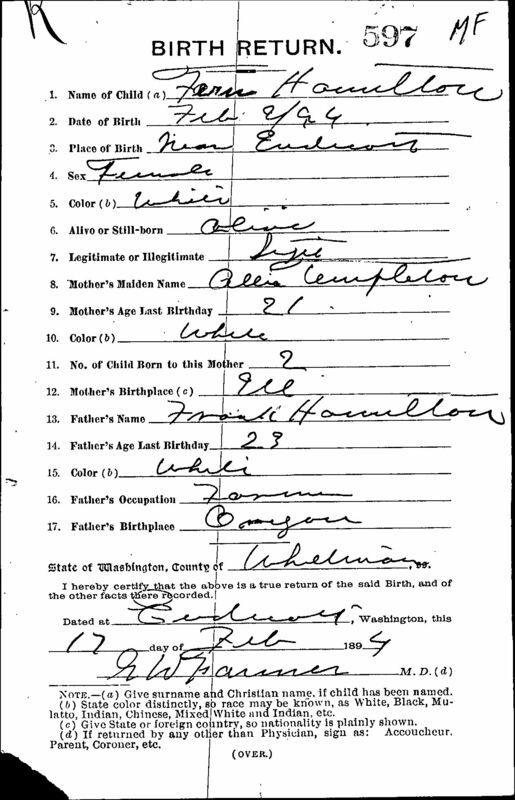 Birth return of Fern Hamilton born to Frank Hamilton and Julia Aletha "Letha" (Templeton) Hamilton near Union Flat Creek, south of Endicott, WA on 2/2/1894. Frank and Aletha (Templeton) Hamilton's children with dates of birth and location. This is a hand-written transcription of Frank Hamilton's obituary. Frank was a son of Supplina and Jane Hamilton. Supplina's obituary is also transcribed at the end. 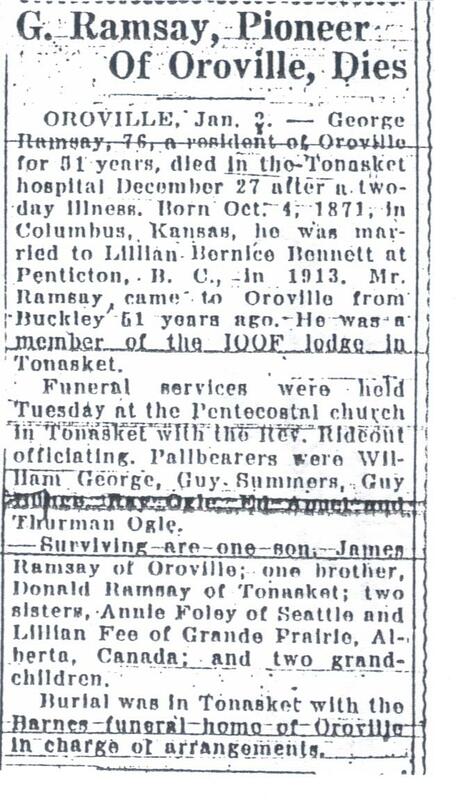 George Ramsay's obituary as published in the Wenatchee Daily World newspaper on Jan. 2, 1948. George lived in Tonasket, Okanogan County, WA. George was a son of James W. Ramsay and Mary Adelaide (Spaulding) Ramsay, and an older brother of Lillian Ramsay who was the mother of Elsie (Galloway) Hamilton. Glenn F Hamilton and wife Retha in the 1920 Census. They are a young married couple in Whitman County, Washington with their firstborn child Hugh at nine months old. Glenn was the son of Frank Hamilton the grandson of Supplina Hamilton. Now here is something interesting: Neighbors to Glenn and Retha (four households aways and listed on the next census ledger page) is the Hiram W. and Emily M. Judd Family. The Judds are older and their oldest son Walter is Glenn and Retha's age. The Judds also have a son named Glenn. Hiram (and Heman) are old Judd family names. Supplina Hamilton had an uncle Heman Judd (and we believe an Hiram also). Supplina also had a Heman and a Hiram as older brothers. Anyway, does anyone know if this Judd family (the only one in Whitman county in 1920) is related? I'll post the next page of the census ledger for all to see. 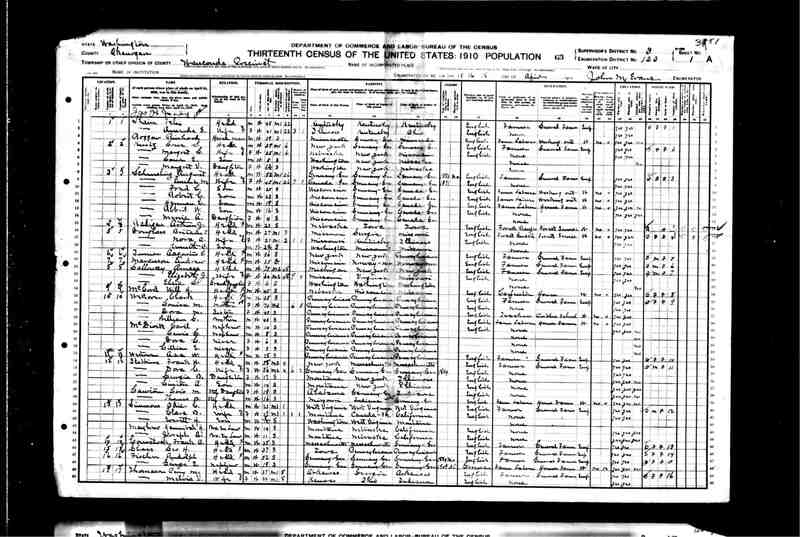 The Hiram Judd family is living four households away from the young couple, Glenn F and Retha Hamilton, in Whitman County, WA in the 1920 US Census. This Judd family has no known relation to the Hamiltons. Yet, because of the fact that both the first and last names (Hiram Judd) are established Judd family names and that both of Hiram's parents were born in New York (though he was born in Wisconsin) leads me to suspect they may have been distant cousins. Supplina Judd, Sr.'s had at least one son that remained in NY state (Heman Judd). Could it be that this Hiram Judd is one of Heman's decendants? It's possible that Hiram could have been a son of Suplina 'Squire' Judd, Jr. (who came to Illinois with the Hamilton's from New York). Only further research will reveal it. If anyone, has evidence or opinions... please let me know! Glenn is a son of Frank Hamilton who was a son of Supplina and Sarah Jane 'Jane' Hamilton. Glenn lists his date of birth as January 25, 1893 in Endicott, WA. He is a married self-employed farmer in St. John. The card is signed and dated June 5th, 1917. This page of the Washington State Birth Index shows two children of Frank Hamilton and Julia Aletha 'Letha' Templeton. The first is Glenn Francis Hamilton born on Jan. 25, 1893. The second is Fern Jane Hamilton born Feb. 2, 1894. Both were born near Endicott in Whitman County, WA. Fern would marry Robert West.